In my work, I primarily try to promote positive contact and an ‘open-minded view’. If all parties are able to understand and accept how a particular situation has come about, this is a good start for embarking on a new path. For me, ‘gaining experience’ in the voluntary sector started early: as a youth leader, student representative, doing community service with homeless people, international youth work and with Action Reconciliation – Service for Peace in Poland. I completed my studies in Slavic Languages and History (Freie Universität Berlin / Krakow / Leningrad) with a scholarship from the Protestant academic foundation, Studienwerk Villigst. I wrote my dissertation on Polish and Russian school history books. I later completed further training in faciliting for large groups, management training and holistic organisational development (www.trigon.at). 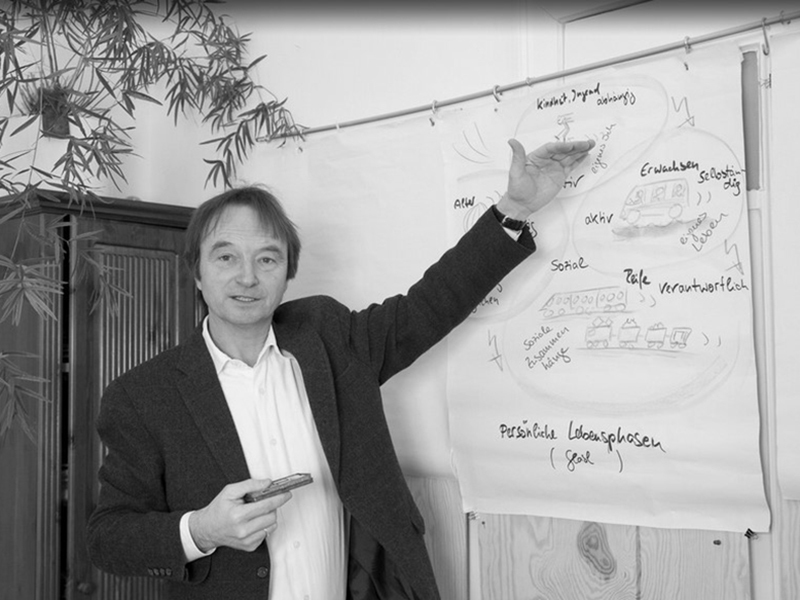 I also qualified as a coach with Dr. Werner Vogelauer. In 1992, I founded DRA, the association for German-Russian exchange, and I was its director until 1997 (and voluntary chairperson until 2009). In 1998, we were awarded the Theodor Heuss medal for active citizenship and in 2003 we established a foundation. For many years, I was also chair of the parent council at my younger daughter’s grammar school and a member of the board of trustees (and later chairperson) for the Stiftung Mitarbeit foundation. In 1998, I founded the SOCIUS consultancy and was managing director and principal associate until 2013. I am currently a board member at the SOCIUS cooperative; we are now trying to formally and legally establish joint and cooperative management of SOCIUS. I live with my partner, I have two adult daughters and am trying to get used to being called ‘Opa’ by my grandchild. My partner is a psychotherapy practitioner with her own practice for Gestalt and constellation work. We live in Berlin Charlottenburg with a dog, cat and lots of chickens in our garden. I draw a great deal of strength from nature, on walks and in contact with animals. It is no coincidence that with increasing age (I was born in 1960), ‘searching for meaning’ has become more significant to me and my work. Last year, I spent a week in silent meditation at a monastery; this was an important step for me and opened up a new approach to issues such as transitions, parting, separations and transience. In development support and in new formats, such as the leadership academy, I try to combine ‘quick thinking’ (intuition) and ‘slow thinking’ (reason, loosely based on Daniel Kahneman) and enjoy learning together with others.